7 Crazy Tiki Drinks from Around the U.S.A. Experiencing a frustrating ebb and flow of popularity since its heyday in the 1930s, tiki cocktail craft is finally flourishing once again. The fresh juices, historic recipes and laidback tropical aura are all being spread thanks to a new generation of bars around the country. With that tiki resurgence comes fresh ideas. The classic cocktails remain sacred, but who can resist the allure of a pirate’s treasure chest brimming with rum or a flaming volcano bearing a bubbling punch? 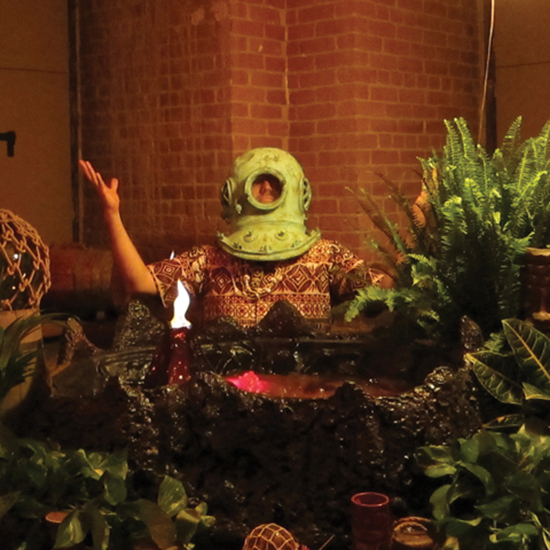 Answer the call of the tiki gods and escape into a paradise of oversized straws, ample dry ice and cinnamon-fueled flames with the country’s most show-stopping tiki drinks. This article appeared originally in Liquor.com. 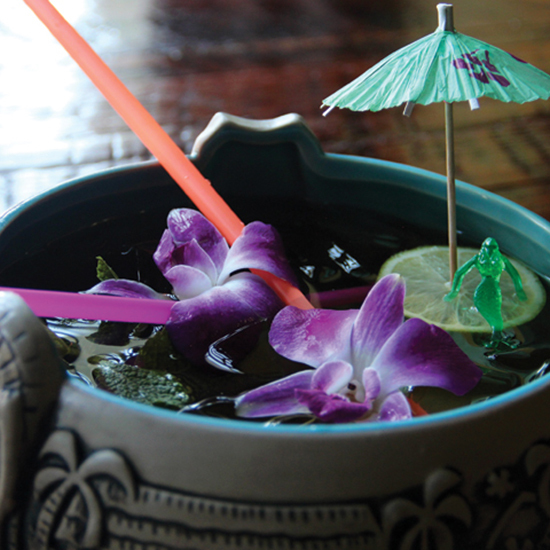 Forget the kitschy ceramic coconut mugs you’ve seen at other tiki bars. ZZ’s highly-curated raw bar is supported by a stellar list of $20 cocktails, each named after its base ingredient. The signature showpiece? 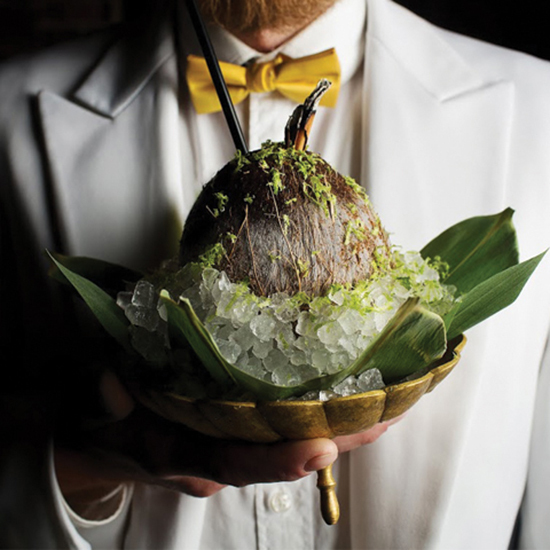 The Coconut cocktail, presented in the furry fruit itself over a mound of ice pebbles. Trinidadian rum, Acacia honey and house-made coconut cream pool inside a fresh coconut, which is garnished with a stick of smoking cinnamon bark. A play on the Bee’s Kiss cocktail (itself a twist on the Bee’s Knees), the Coconut swaps heavy cream for coconut cream. It is—understandably—one of ZZ’s most popular drinks. Located in the same spot as the original 1953 Don the Beachcomber restaurant, you might say that Bootlegger has good tiki juju. The cocktail menu was designed with Donn Beach’s original creations in mind and stays true to Donn’s methods, using only house-made syrups, freshly squeezed juices, small-batch spirits and locally-sourced produce for garnishes. Ready to get to the heart of the bar’s history? Wrap your hands around the Gooney Goo Goo, a tall, grimacing character stocked with port, cognac, every fresh citrus juice imaginable, orgeat, cinnamon syrup, bitters and a lime wheel doused with overproof rum and set aflame. Don’t be deceived by the tame mug. The A Huevo cocktail is made with a base of “leche de monja,” a home remedy originally concocted in the mountains of Peru to promote fertility. The active ingredient? Two freshly-laid whole eggs, submerged in lime juice for two weeks. That acidity eats through the egg shell, leaving rubbery membranes around the raw eggs inside. Those questionable leftovers are tossed in the blender along with pisco and sugar, resulting in leche de monja. At Tiki Tolteca, that’s shaken with falernum, passion fruit and ginger beer and served with a very peculiar garnish—the jambu flower. Native to the Amazon, the flower causes a numbing, tingling sensation in your mouth when eaten, which apparently accentuates this drink’s passion fruit flavor. 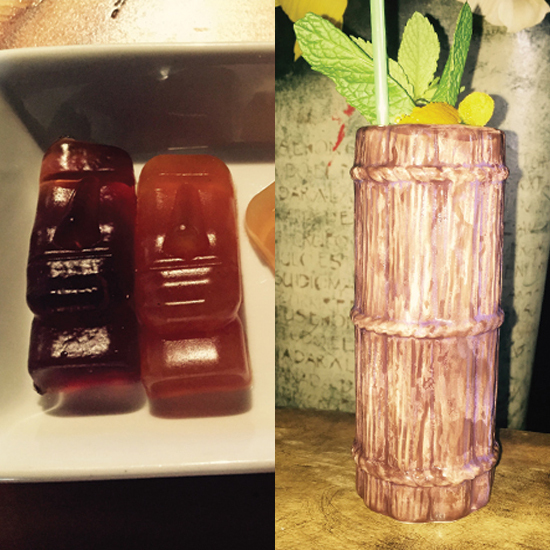 If the A Huevo is a little too adventurous for you, stick with Tiki Tolteca’s Tiki Gummies. Spiked with the ingredients for a Zombie, Hurricane or Mai Tai, the Gummies are ideal for under-the-radar imbibing on the go. A phrase rarely found on cocktail menus? Glow-in-the-dark punch. No, this isn’t a rave. Otto’s is a beloved Polynesian joint that’s been pairing tiki drinks with live rock and roll since 2002. And the menu’s main event is touted as a glowing blue “radioactive rum punch.” Don’t worry, you won’t find any toxic waste lurking in a glass of Pang’s Punch, but there is an element of mystery involved. 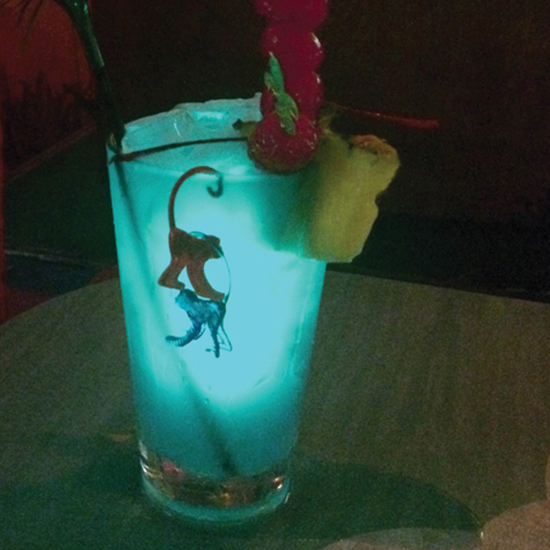 When pressed for the secret recipe, the owner divulged the following: rum, coconut, pineapple and “magic.” The particular brand of magic is anyone’s guess, but that—and the drink’s steel blue glow—make Pang’s Punch an instant conversation piece. 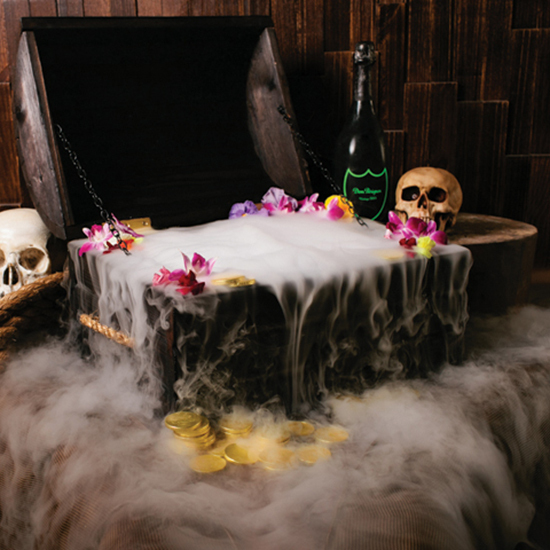 Any number of Three Dots and a Dash’s signature drinks inspire tiki rapture, but it’s hard to top a literal treasure chest of booze. Adorned with tropical flowers, gold coins and grinning skull sidekicks, the chest requires a motley crew of barkeeps to roll out. What waits beneath the shroud of dry ice fog spewing from its mouth? A blend of rum, strawberry, passion fruit, vanilla and lemon juice, finished with a full bottle of Dom Perignon. The sea-worthy chest serves six to eight people—who will need to slurp it up through extra-long straws—and will set you back a cool $385. Don the Beachcomber kept his recipes close to the vest. It took a tiki anthropologist like Jeff “Beachbum” Berry to decipher the complex cocktail codes the trailblazer left behind. One of those secret recipes? The Lapu Lapu, one of the Beachcomber’s unpublished recipes from 1964. Recently discovered by Beachbum Berry after 40 years in hiding, the Lapu Lapu can now be found on the menu at his NOLA cocktail bar. It’s served in an oversized bowl garnished with flowers, banana leaves, plastic mermaids and paper umbrellas and serves at least two people. Named for the Philippines’ respected 16th-century warrior chief, the communal vessel is filled with a blend of dark and light rums, citrus juices, simple syrup and the crucial ingredient—passion fruit syrup. 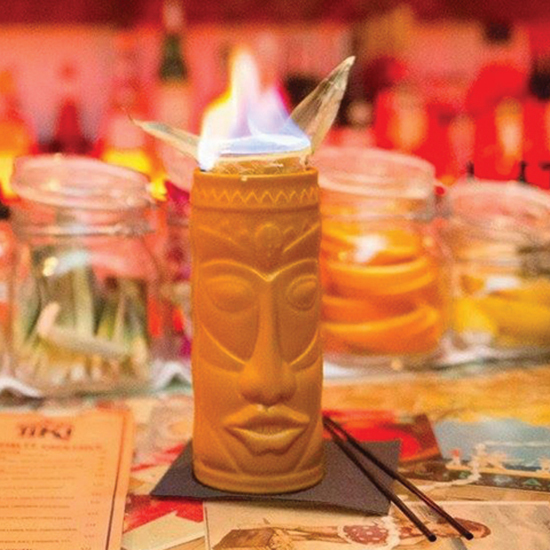 Bow down to the granddaddy of all tiki-dom. The ultimate off-menu item, this Krakatoa Bowl is only available for special offsite events and can serve an astounding 300 people. Astounded they’ll certainly be when they witness the preparation of this mighty tiki beast. Custom-made for Smuggler’s Cove, the massive bowl begs comparison to a foaming hot tub. It’s outfitted with underwater lighting, bubbling pumps and a hair-raising punch made with more than 24 bottles of rum. Black tea, fresh lime, Demerara syrup, cinnamon and vanilla round out the giant-sized recipe, but it’s the ceramic volcano set in the middle that elicits cheers. Set ablaze with a spark of cinnamon, the roaring Krakatoa Bowl is a sight to behold—and one you’ll want to consider for your next office party.